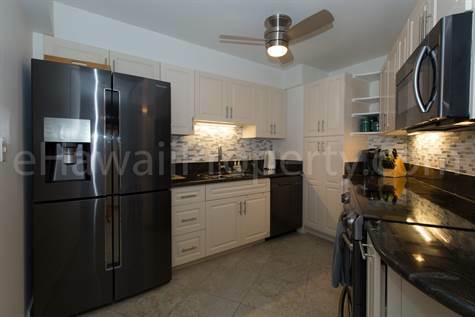 Newly remodeled kitchen with Diamond Head and some ocean view. Cool lanai with only morning sun. Fully furnished 2 bedroom 2 full bathroom and one assigned parking stall. There is a 3 month minimum rental in this building. Rent includes all cable tv, Internet, (wifi) and electric up to $100.00 per month. Tenant pay electric over $100 per month. Wailana at Waikiki has a great location just across the street from the beach and walking distance to Ala Moana Beach Park and Shopping Center. It is also on the bus lines. Unit is fully furnished and ready to move into. Just bring your clothes. Everything else you need is in the apartment including a treadmill. Unit available until December 15th.